In stock 71 items in stock. We want to show the world that OSHW is not just circuits and PCBs. The idea of open source can be applied to just about any product . This S.H.O.V.E.L. is intended as more of a figurehead example of open-sourcing EVERYTHING. 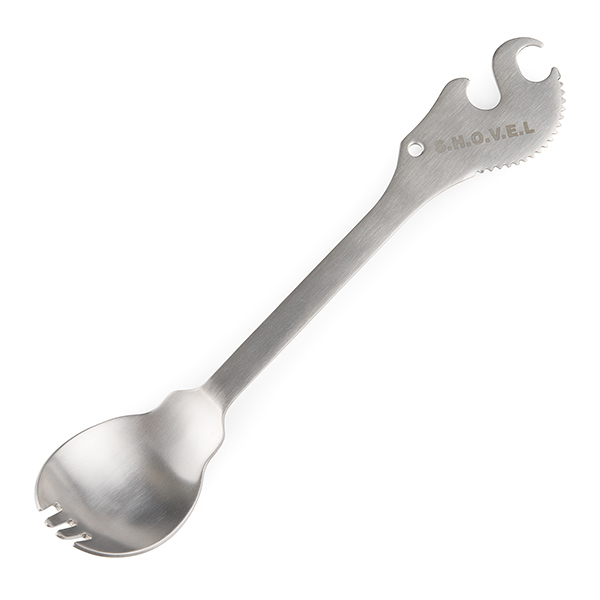 In the end, we hope that open-sourcing doesn't stop with circuits, let alone a spork. The sky is the limit with OSHW. Think you can design a better S.H.O.V.E.L.? Go for it! Download the files below and make your own. "No patents pending." This is perhaps the coolest application of OSHW ever. I had never thought of Open Source this way (applied to "simple" products) before, but indeed, the sky's your oyster. Edit: Sure the "good luck concentrator" isn't just a "minor skin ablation device"? Now you can open sauce with your open source. For a new revision you should add a 6 inch (or so) ruler engraved on the shaft :) but i love the product its very cool! Inches one side, millimeters the other, doh! Ummm.. You COULD put a real can opener on the end instead of your logo. That would also work as a bottle opener, and you could still make the rounded edge of the can opener a serrated knife. This is cool, but having it be a can opener too would be far cooler. This would be a great idea! Would be perfect for camping or a survival kit for opening those old school cans that have none of them fancy pull-tab thingies. Should be called the "sparkFoon". There's no reason it can't be both. I for one will endeavor to think of this as the sparkFoon, because thats just an awesome name. I have no idea what you're talking about. He was taking a nap. OK i got a few days ago. It works great for MREs, the spork side is larger than the mre spoon and is at the right angle for scooping out of the pouch, the serrated part works ok for opening the pouches (about as good as a butter knife) i find the logo part works better, haven't tried the bottle opener yet (need to get downrange for that), the hole for the para-cord could be bigger (say 1/4 inch instead of 1/8 in) i would give 4.5 flames out of 5. The rest of the guys in my squad want one. Please think of the troops and send some of these in a care package!!! Hey so I was wondering how you fine fellows are making these. It looks like it was done on a punch press, but does SparkFun have such a thing in house? These were fabricated in our completely automated robotic orbiting cleanroom manufacturing complex. Or China. We have a guy who knows people who can get things done. He goes by the name Simon. I wonder what the TSA would think about this. So update on this: field testing has found that TSA will indeed take it away. A bottle opener is useful, but a can opener is -more- useful... Especially if the can opener can also open bottles. I don't know how well a can opener would mesh with the logo shape, though. Usually they got a point on the end to punch through the can's lid. As my boss says ................... beer is bread, but bread is not beer ! You know, it's made of titanium so you can pretty much poke holes in most any metal. I experimented with a can of coconut milk. I used the GLC to grip the edge of the can and cut into the rim of the lid with the serrated edge. From my experience I would say it out-performs the average hunting knife for this purpose. I would challenge someone to open a can using just the foon. Something tells me it could be done. Yes! A can opener would make it perfect! I am open-sourcing everything now! You should add "bad word generator" as one of the features. At least until you get the @$#!? para cord fed into that way too small hole. 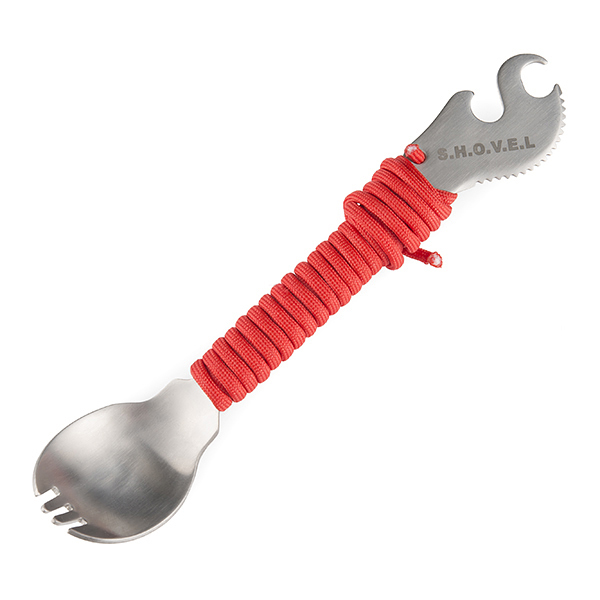 "Basic functions include: fork, spoon, butter knife, bottle opener, and survival rope. Advanced functions must be unlocked through training and discipline." Probably the best Datasheet ever. I am using Autodesk AutoCAD Inventor to edit the .stp file and there are not any surfaces that I can make a 2d sketch on or put a plane parallel to surface through point. How about giving a sparkfun logo shaped rubber cap for the edgy ends ? will be useful and safe.. I would love to see more done with the handle seems like a waste maybe a fish scaler on one side and ruler on the other side? Also any idea when you will get more in? I love how in the datasheet "eating food" is the 7th item in the list of "Can be used for:" right behind cutting down trees. Photo contest needed! You using your S.H.O.V.E.L out in the wild. Remember, is more than just a tool for loading fuel into your system. great that it's OSHW, but any suggestions how to actually get some made (that don't cost more than a B2 bomber toilet seat)? else the openness is rather moot. C'mon guys, fess up - the "Good Luck Concentrator" was a can opener that didn't work, right? It's actually the left side of the SparkFun flame logo. Try squinting and tilting your head to the left to see it! What exactly does a "Wrap para chord" sound like? Yea yea. Ima change it when I get around to it. The world needs a knork. Your IT department concedes a serious oversight on this one. Yaay! Stock Arrival Notification in my inbox!! Just in time for ARRL Field Day! I love the taste of cold baked beans for breakfast. Kayakers will love this product too. 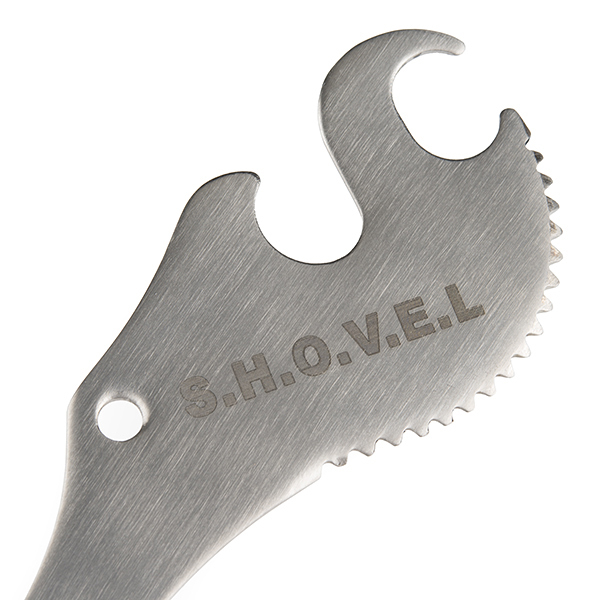 Put a hole near where it says shovel so I can put in on a carabiner or tie a string to it. Actually, I think just a hole for some line would do, that would be a smaller hole than necessary for a 'biner, and then use the string to attach to the 'biner. That hole is to anchor the paracord. Otherwise it will just unravel. 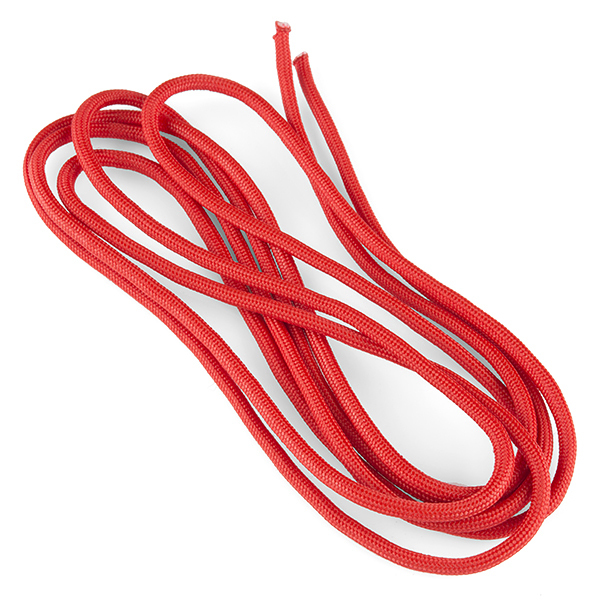 I would prefer not making a choice between paracord, or tie off string. I would like both ! I'm sorry I failed you. You could also leave a hoop in the paracord. Ahh, a "Swiss Cheese" SHOVEL! I can see picking up a couple for camping, and too many sharp edges to be in a back pocket, and can never find a bottle opener at 2am sitting around a camp fire ! I think it is really cool how this incorporates the SparkFun logo. However, it is probably a bit dangerous to just throw this in your backpack. Could use a case. well depends on what you are printing it in. When examining the available features that come standard on this item, combined with the consideration of the manufacturing techniques involved and and trade-offs required to achieve a $10 dollar item. This is the best possible use for your money. Hands down. He was very excited to get it for his birthday, but I don't think he's had a chance to try it out yet. But I know he will first chance he gets. Perfect tool for eating and opening! 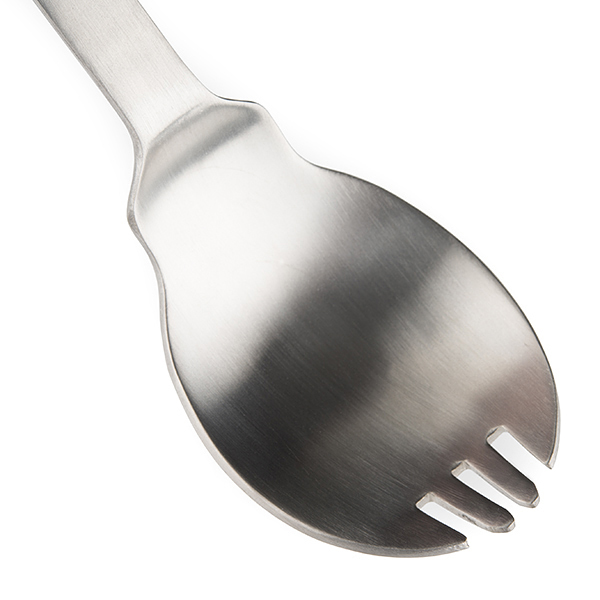 I bought several of them for my friends (and one for myself) as a more "ecologically conscious" replacement for the plastic sporks at the local fast food places where we get together (and good Xmas presents). However, that hole for the paracord could stand to be a bit largeer, which is why I could only give it 4 stars rather than 5.